On Friday, Ramoo said his son woke Yatim up as usual and they ate bacon and eggs, after which Yatim headed to Fairview Mall, promising Braden they’d play again soon. Yatim spent the day at the mall and later hung out with some of his high school friends. He called Nathan Schifitto, who lived with him at Ramoo’s, later, around 10 p.m. They were to meet at Ramoo’s apartment. Yatim never made it back to the apartment – nor kept the play date he had promised Braden, who now sleeps in one of his sweaters. What happened between 10 p.m. and midnight remains a mystery to Schifitto, 28, who says Yatim’s alleged conduct on the streetcar is out of character. Witnesses say that just after midnight Saturday Yatim brandished a knife and exposed himself. No one was hurt, and all the passengers were able to exit the streetcar onto Dundas St. near Grace St. In a video shot by a passerby, Yatim can be seen standing alone near the front of the streetcar as officers surround him. Then nine shots were fired and a Taser deployed. Sasha Maghami, who describes herself as Sammy’s “best friend, ” last saw Yatim on July 21, before she left Toronto to volunteer in Australia for five months. He seemed less talkative than usual and didn’t “play fight” with her as he normally did. As Maghami walked towards her bus, the last thing Yatim said was: “Don’t forget me out there.” The two were supposed to Skype for the first time on Saturday, the day she found out he had been killed. Yatim came to Toronto to live with his father after his parents divorced. His mother still lives in Aleppo in Syria but has come to Toronto to deal with her son’s death. Friends said he deeply missed his home country, where he returned most summers, but he didn’t appear to be affected by the civil war there. He was close to his mother, a pediatrician, and fiercely protective of his 16-year-old sister Sarah. Joshua Videna, 19, said he last saw his high school buddy a month and a half ago. Yatim told him he had left home after fighting with his dad about his marijuana use. Ramoo and Schifitto were helping Yatim adapt his new life for the past six weeks. They would pick up odd construction jobs and bring Yatim along to help out. 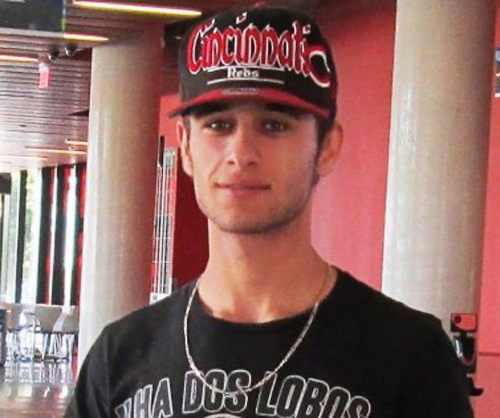 “He was always learning, working hard, ” said Schifitto, adding Yatim planned to move into his own place in September. Yatim and Schifitto renovated a room in Ramoo’s apartment to share, repainting the walls, building a bunk-bed and wedging a couch underneath it. “He basically built himself a teenage dream room, ” said Ramoo, remembering how little Braden always wanted to hang out in the fort-like room with Yatim. Schifitto slept up top and Yatim down below on the couch. A Sony PlayStation and big screen TV kept them entertained, along with fish in a nearby aquarium. Beside the aquarium, a set of weights lay on the floor Monday, one of the last things Yatim touched in the apartment before leaving for the mall.